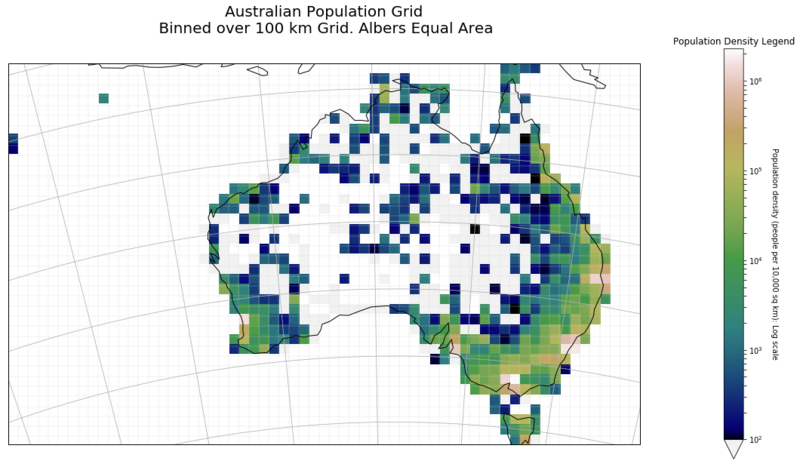 The Australian Bureau of Statistics (ABS) make available a population grid. Essentially, they estimate the population living in each 1 kilometre grid cell, and make this available as a GeoTIFF (amongst other formats). 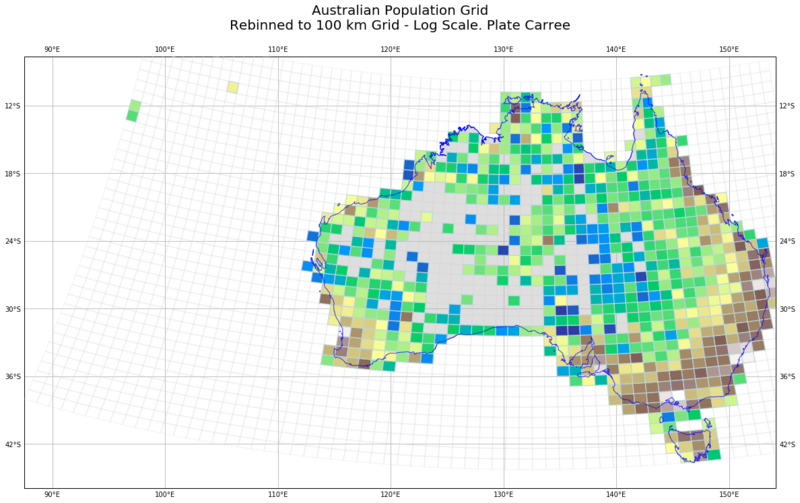 There is a lot of tricky estimating to go from the usual Census data to a mesh grid, that is explained in the website. I thought it might be fun to look at visualizing this in different ways. I found myself chasing down some interesting cartographic rabbit holes, and learnt a useful Pandas trick. The first thing I did was to read the GeoTIFF, and work out what projection was used. A couple of things jumped out at me. First, they are using an Albers Equal Area Projection in which to draw the mesh grid. It makes sense to use a Equal Area projection (not to use one would be weird), but the choice of Albers is unexplained in any documentation I could find. There is an European Union project that is very similar (GEOSTAT 1A – Representing Census data in a European population grid), that uses a different projection. However, the EU case is made harder for the statiticians because the EU has to match the use of grids in differing projections by its member states. In any case they seem to be using a Lamberth Azimuthal Equal Area.
" ... keep in mind that GDA94 coordinates are fixed as at the 1st January 1994 (epoch 1994.0) and that the Australian plate is drifting in a north-easterly direction about seven centimetres per year." It appears that the Spheroid used is almost exactly the same as WGS84, which is a relief. We can use the default Globe provided by Cartopy. 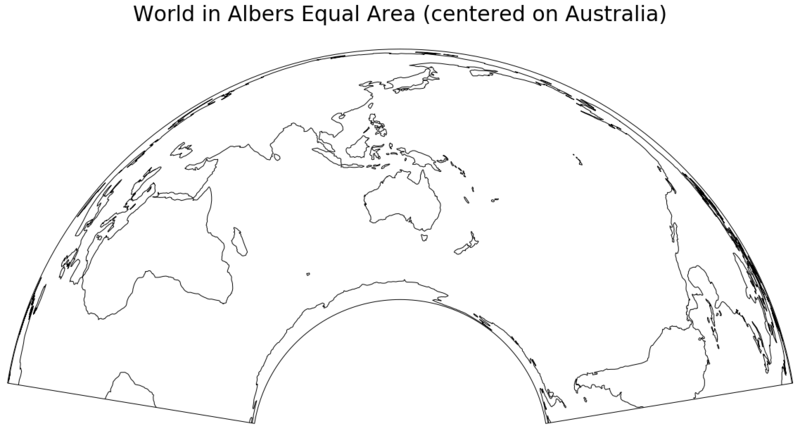 and then see what the world looks like in this projection. 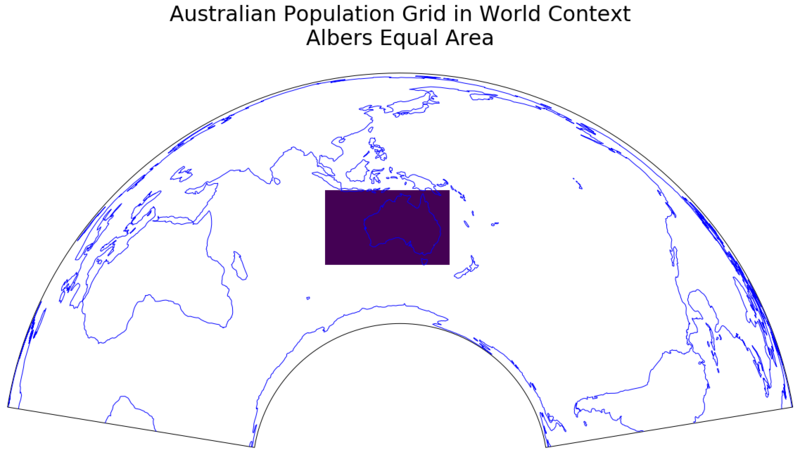 So let us use that extent (in the albo projection units) to zoom into Australia, show the TIFF file, and plot some coastlines. The TIFF file is a single band, and we use the default color map to map population density to a color. shows Australia in a global context, and reinforces the fact that our grid is rectangular (but only in the albo projection); we will come back to this later. 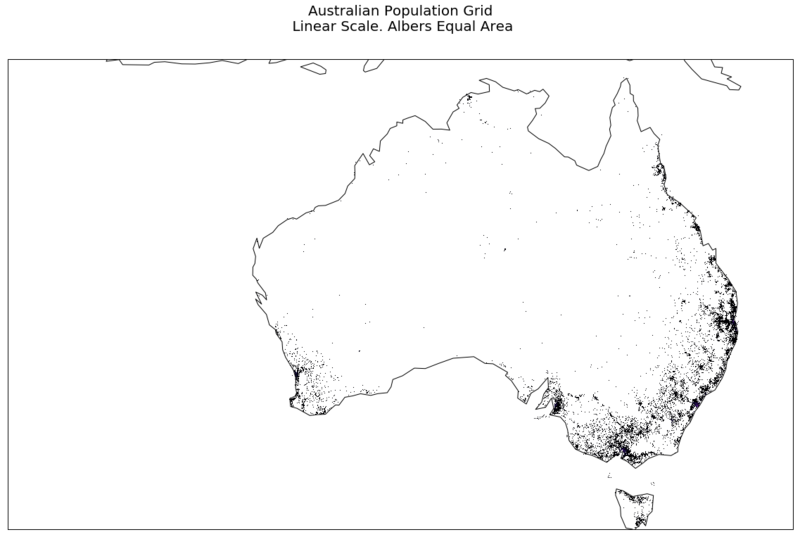 At this scale, Australia's centres of population are so small you can't see them. This defines the minimum and maximum longitude, followed by minimum and maximum latitude. We display the Open Street Map tiles that cover this region, and then overlay the population grid over this. 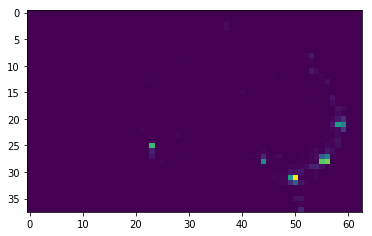 I use a trick with matplotlib color-maps; I define the color of the pixels that are under a (to be defined) value to be white, with alpha=0; effectively, I set these pixels to be transparent. Then when I call imshow, I set that value to 60 (vmin=60). This gives me a map with areas under 60 people per square kilometre to be clear, and rest to have a color-coded shading applied (alpha=0.5). To pursue this theme a little, in the next example we set the over value behaviour to be fully transparent, and the under value behaviour to be black, almost opaque alpha=0.8. 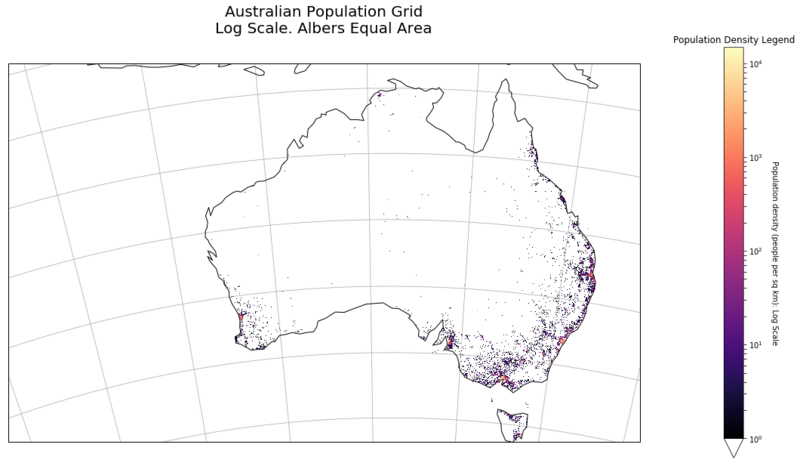 The following code plots each pixel of the GeoTIFF (except zero population cells are left transparent), and again, while it shows the emptiness of Australia, it does not really let you see where the majority of the population are to be found. That is, we have taken our original 4 row, 6 column array, and reduced it to a 2 row, 3 column array, with each element holding the sum of the sub-array that has been collapsed. We have data.shape gives (3821, 6382), so we take a chunk that is a multiple of 100 in row and column directions. We then shrink our data by data3 = shrink(data2, 38, 63). Now the simplest possible display shows some non-zero values. In the next example, we plot a red bubble at each zon-zero cell of the grid. We also draw the grid itself (very faintly, alpha=0.2). Now, when we plot the value of each cell, using a Log scale, we get a more understandable graphic. You can see Australians for the most part hugging the coastline; you can see the big mining towns like Mount Isa and Broken Hill. The code that produced this is below: as before, we plot the grid lines faintly (straight lines in this projection). Finally, just for fun, I plot the map in the Plate Carree projection. This makes the population grid look curved, but thtis to be expected. I also decided that I wanted to distinguish between a population count of zero because there is nobody there on land, and because it is out to sea. I learned a few things, because I decided to draw the non-rectangular patches myself (imshow seems to be very slow in reshaping an image). First, we calculate the extent of the GeoTiff in longitude, latitude units. Then the usual preamble to set up the Figure, and the Cartopy aware Axes objects. Note we go down an extra 3 degree of latitude, because the Albers grid sinks down below the lines of constant latitude. 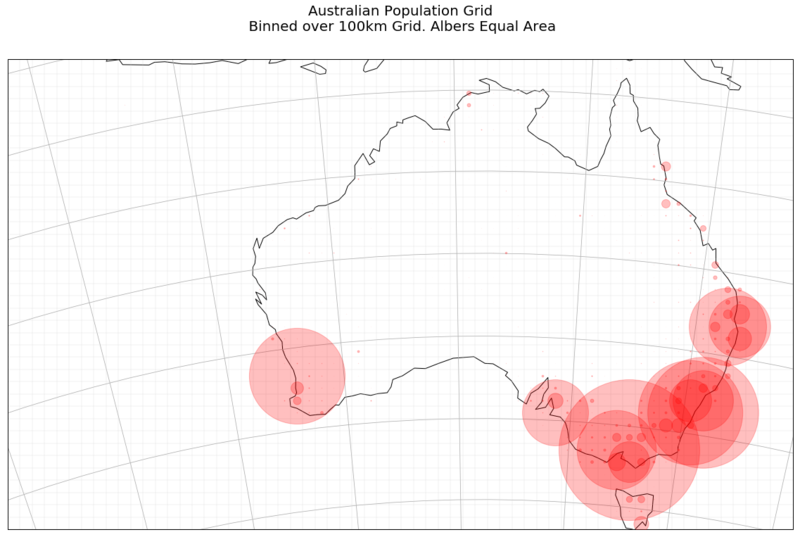 We now use GeoPandas to read the Australian coastline, and fill the interior with light grey. We then cycle through all the cells of the 100 km grid, transforming the Albers coordinated into Plate Carree coordinates (longitude and latitude), and draw the grid faintly (alpha=0.2). Then if there is anybody at all living in this 100 km grid cell, we create a patch, and remember its color. We use the terrain color map. At the end we create a PatchCollection, set the colors, and add them to the Axes object. We then draw lat/lon gridlines, and set a title. For completeness, here are the imports for this Jupyter Notebook (not all are used in the code fragments above, as some are for producing output to support reproducability). This series of blog posts is provided as a resource by net-analysis.com - PO Box 857, Coolum Beach, QLD 4573, AUSTRALIA. ABN 19469649963. Ring 0413 208 746, or visit the company website: http://www.net-analysis.com. It documents a learning process, and hence owes a debt of gratitude to all the people who have documented their own experiences on the web: the list is too large to enumerate.